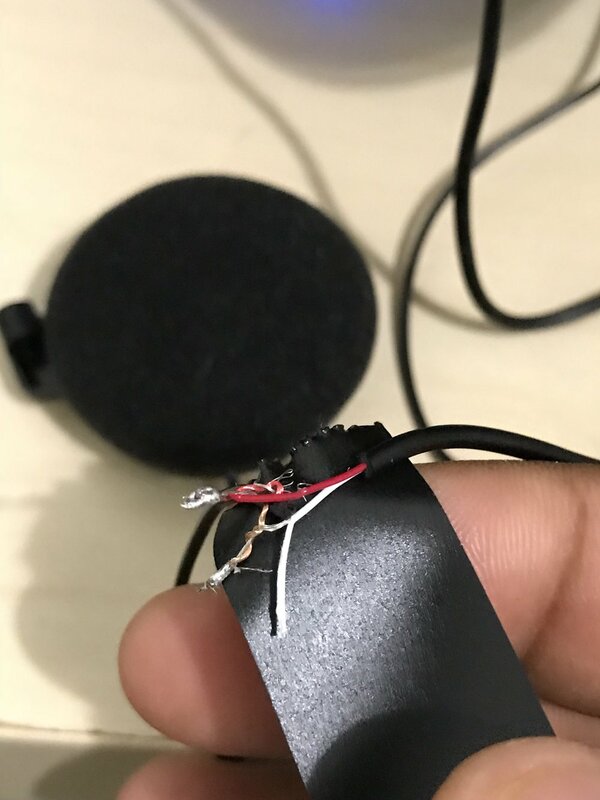 Replacing headphones on a Sena SMH10-11 Bluetooth Communicator — Ashraf — product designer with optimism. I purchased a Sena SMH10-11 Motorcycle Bluetooth Headset and Intercom for my HJC CL-MAX II Modular Helmet (FYI: while the helmet is advertised with bluetooth support, you don’t actually need the cavity for installation. I kept the cover on and installed the Sena using the included clamp). The Sena comms are pretty awesome. The controls are dead simple to use and can be used with gloves. There is Siri functionality (just press the phone button and presto!). And I paired it with another helmet and Sena's SMH5-02, a cheaper model and was able to talk to my rider buddy with at least half a mile between us. Here is the stripped cabling with the existing Sena headset beside it. Notice the (poorly) tinned areas of the cable and the electrical tape. I added velcro and labeled the speakers for future debugging purposes. The built-in speakers have a crackling quality that works fine for talking. However, when you listen to music, the mids and the weak bass are a shame. This specific Sena has a hard wired headset so no 3.5mm adapter for me. I really wanted to bump up the sound quality, so I purchased a relatively cheap (but better-than-average sounding) clip-ons from Koss. The KSC21 Sport Clips were the perfect size to replace the existing headset. I turned on the bluetooth and had a song play on repeat so that I could ensure the connectivity was functional. Then I got to work. I stripped the cables from both ends. Then, I got my soldering iron out and tinned the tip. I twisted the cable ends for the ground ends (white) and to the earpiece (red). I had some issues with my first run of the application, so I used an x-acto knife to try and strip the cable on the Sena end. It wasn’t easy. I realized that I could use the heat from the soldering iron to melt through the cable, tin the tip, and then connect it to the clip-ons. For the final touch, I added some velcro to the ear piece so that it would sit in the existing velcro housing. I used some electrical tape to tape down each cable, to prevent it from shifting or breaking. They are quite fragile strands of wire. I stuffed everything back into the helmet and powered it up again. Once I donned the helmet, I could hear the music loud and clear. Being able to listen to awesome tunes while riding is such a blast. Now with the higher quality buds, I’m just glad I’m not subjected to disappear mids and bass. Ride on!